Access all your important company, team, and individual data in real-time and in one place on any connected device. This data is available across any date range, takes seconds to load, and all the data that sits behind the numbers is one click away. You can set, manage, and keep the history of targets and goals for company, division, team, and individual recruiters and sales staff, and see a snapshot of the how each part of the company is performing alongside each other. 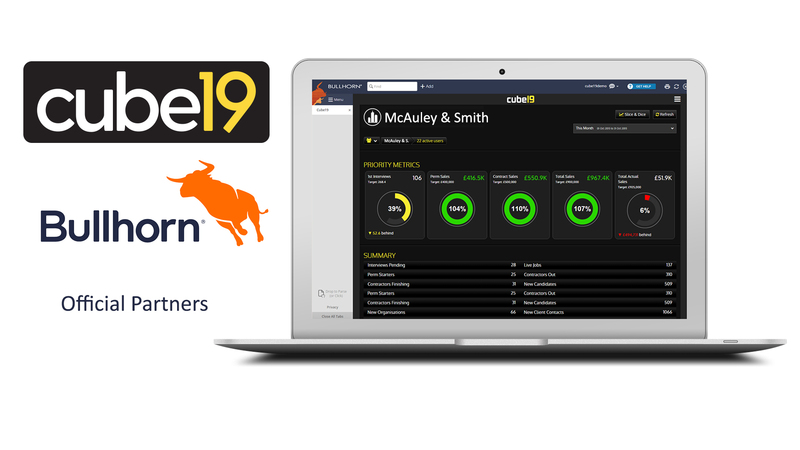 cube19 allows users to generate real-time, custom reports and trends over Bullhorn data and financial systems without needing specialist training or skills. Create and share almost any report in seconds so that users can analyze performance, clients, jobs, candidate activity, revenue, fees, candidate and placement source, time-to-fill, and much more. cube19 features beautifully designed, wall-mounted big screens showing activity and sales leaderboards, trends, and key company statistics and data. The platform features incentive management and deal flashes (with pictures and optional music) and is designed to encourage competition, drive sales performance, and encourage timely and accurate Bullhorn data entry. Specially designed configuration for each customer delivering configured metrics, created to replicate your business workflow. No matter which custom fields are used in Bullhorn, they can be incorporated into cube19 to create a tailored solution.